How Does a Double Boiler Work? A double boiler uses an indirect method to heat delicate food items such as chocolate, milk, cheese, custard and some sauces. These foods are easily scorched or burned, so the typical method of heating in a pan directly on top of a stove, or a pot in the oven can ruin them. Double boilers also are a good way to keep cooked foods warm before serving, without overcooking them. Double boilers consist of two fitted pots, commonly made of glass, stainless steel or aluminum. A single lid fits on the top pot. 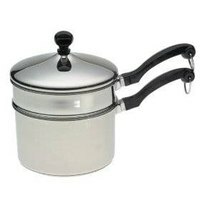 The larger pot can function separately as a saucepan, but often the top pan has a thinner bottom that is not as suitable for direct heating. The design can be one pot nestled on top of the other with the bottom of the smaller pot inside the larger one, or one smaller pot fitted mostly inside another. The cook adds water to the bottom pan, which, when heated to boiling, heats ingredients in the top pot through steam or indirect heat. The double boiler design limits the maximum temperature in the top pan to the temperature of boiling water, which typically only reaches 212 degrees F. This allows substances in the top pan to heat slowly and thoroughly without risk of burning. A double boiler can be improvised with two saucepans where one fits snugly on top of the other, or a pot of boiling water with a glass cookware bowl on top. A double-walled pot where a person adds water between the two pots also functions as a double boiler. Chocolate in particular should always be heated in a double boiler, because direct heat can ruin its consistency. Candy makers use a double boiler to keep their syrups warm before molding. Delicate sauces, such as hollandaise, are best made in a double boiler. People making soap and candles also use double boilers to keep the ingredients in a liquid form but also prevent them from burning. Items that need continual stirring or which cannot have water added from condensation, such as chocolate, must be heated without the lid. What Can I Use If I Don't Have a Double Boiler?